I thought it was high tide er..time that I did a seashore tablescape. Everything on this table was bought new but, on clearance except the napkins, Coffee cups and teapot. They were all 2nd hand thrift finds There are just so many fun items of this theme for your table. Most of the things here are from the Christmas Tree Shops and the rest from TJ Maxx. As you an see, the sun was not cooperating with me! These are fun plaster letters with sea glass and shells embedded in them. They were clearanced for .50 cents each at CTS. I started with a quilted stripe table runner (a gift from TJ Maxx folks) and then used a round woven white placemat (CTS $1.00). Then the shimmery green scalloped chargers (CTS .89 cents). The round orbs with glass and shells were also from CTS for .50 cents). I love the cool colors in these plates. They too were from CTS for .50 cents each. The blue seashell votive holder and the orb with the shells and sand were both clearanced for .70 cents at TJ Maxx. This bottle with rope and shells was on clearance at CTS for .47 cents (the bottom is missing). The matching platter was .50 cents (CTS). The two large white seashells are salt and pepper shakers (CTS $1.00). The bird was clearance (some breakage on it) for .29 cents at CTS. The shells and glass I had. The blue tumbler I got on clearance a year ago at CTS and the aqua glasses were from a Dollar Tree. How cute are these initial flip flop coasters! From CTS. I bought a set of 4 of these seashell napkin rings from TJ Maxx clearanced for $1.00. Blue lanterns and blue glass seashell bottles from CTS for under a $1.00. I bought the white salad plates at TJ Maxx last year for $1.00. Well, that as my fun clearanced seashore table. I hope you enjoyed your visit! I love this table and all the sea inspired ideas, like the sea shells and the aqua plates; simply perfect ! The flip flap coaster is the cutest thing. Pinning it. 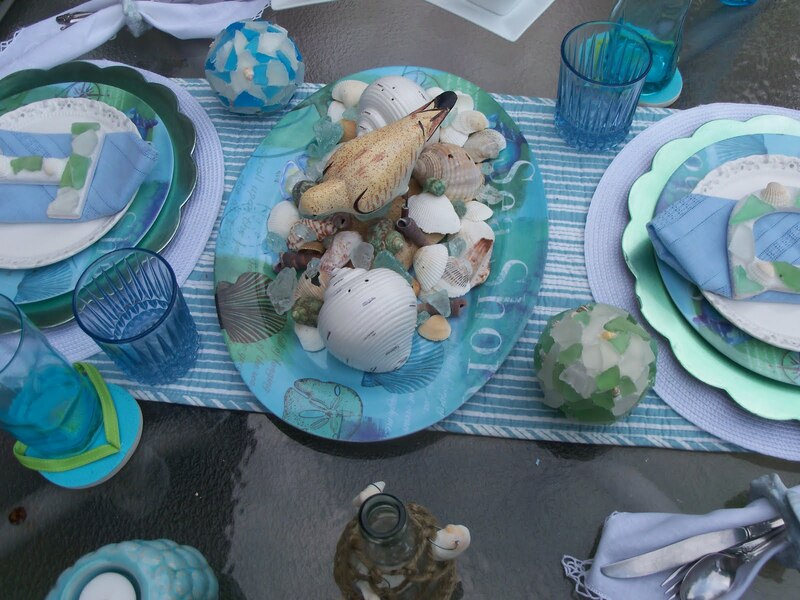 A beautiful beachy tablescape! I love it all! Enjoy your day and have a happy week ahead! I am swooning over this table. I adore these colors and the fun table decorations and the prices you get from CTS!!! Makes me ready for some blues and greens here! Just one question?? Where is the L for Linda?? So pretty! I never saw those initial coasters or letters at CTS! You found some great bargains, Diann. Great job on putting it all together! Pretty!!! A fun table setting!! Kudos on your bargain shopping!!! I love it all! The colors are all my new favorites! I have to hit CTS and TJ MAXX more often! It's all do beautiful. I can't believe the deals you got--wow! Love those scalloped plates. I've not heard of CTS but definitely will be checking them out. Lol I meant SO beautiful haha! Love the colors of the sea glass! The blues and greens are so peaceful. Love, love your tablescape! How do you find such bargains? We don't have a CTS. I've never seen anything so cheap and adorable! Thanks for setting a summery table. Love the shells and pretty plates. Definitely brings the seashore to mind. Pretty for summer fun.